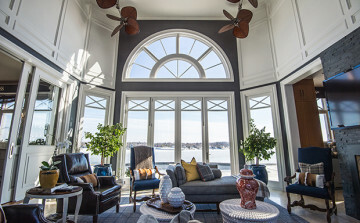 Inspired by its stunning location and the goal of a spa experience, this coastal home set high above the Navesink River in Red Bank is the culmination of five years of intense work for a husband and wife team. Utilizing the talents of Anderson Campanella Architects, the couple worked with the architectural team for three years to create the perfect home. Two years of construction later, the residence was completed in 2011, complete with the “seashore feeling” that the couple had envisioned. The entire home is custom designed and no detail was overlooked. The couple used several decorators and their own expertise to finish the 10,000-square-foot project. The exterior is cedar shake and looks at home on the river. The roof, with copper accents, is finished in brown. The brilliant white home has navy blue shutters, evoking a Ralph Lauren aesthetic. “It’s just gorgeous,” she said. The Loewen windows are traditional and the home includes a turret at its top.